Muhammad Ali, world heavyweight boxing champion, stands with Malcolm X (left) outside the Trans-Lux Newsreel Theater in New York in 1964. The night Cassius Clay beat Sonny Liston, the reigning heavyweight champion, crowds had squeezed into the venue, expecting to watch Liston beat the stuffing out of the young braggart. The odds were 7-to-1 in Liston's favor. The air was filled with testosterone and cigar smoke. Few people noticed the tall, quiet man at ringside, immaculately dressed in a dark suit and tie and crisp white shirt, watching the fight intently. 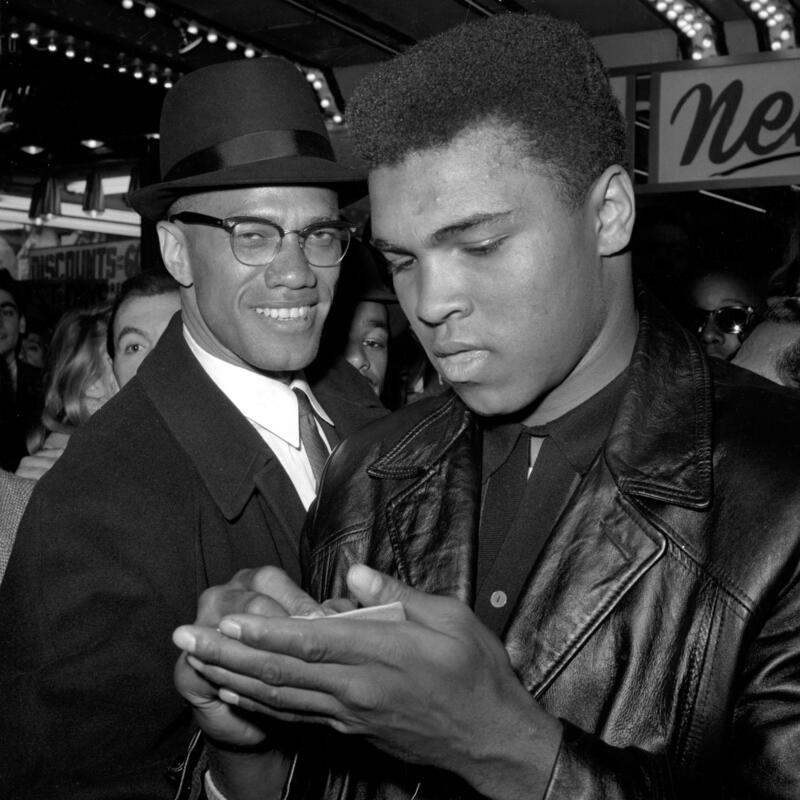 The stranger was Ali's friend and mentor Malcolm X, and he was seen to have smiled broadly when Clay was declared the fight's winner by a TKO in the seventh. Malcolm believed a victory was preordained, that Allah would guide young Cassius in the ring. The next morning, at the traditional day-after press conference, a subdued Cassius Clay told reporters that henceforth he would be known as Cassius X. A month later, he would take the name that would become world-famous: Muhammad Ali. A new book, Blood Brothers: The Fatal Friendship Between Muhammad Ali and Malcolm X, chronicles the friendship between these two extraordinary men. Co-author Johnny Smith, a historian at Georgia Tech, says the two met back in 1962. That's when Sam Saxon, a friend from training camp, drove Cassius Marcellus Clay and his younger brother, Rudolph Valentino Clay, to a Saviour's Day rally in Chicago, an annual event hosted by the Nation of Islam. Saxton was a Black Muslim (as the Nation's members were often called) and knew Clay had been looking for a spiritual landing place. Malcolm was the opening speaker at the rally; his incendiary rhetoric and adept sparring with the press had made him the public face of the Nation of Islam, and the Clay brothers were mesmerized. "There was this confidence, this authority that Malcolm had at the podium that day," Smith says, "and it made a profound impression on young Cassius Clay." Malcolm saw in Clay a charisma that drew people to him. He began to cultivate the friendship, partly because Malcolm hoped he could draw Clay into the Nation; the young boxer could potentially bring admirers into the fold with him, a benefit for the Nation — and for Malcolm. The two began to spend time together whenever possible. Malcolm was part father figure, part big brother to Clay. His faith was also a draw, because Clay had rejected the faith he'd grown up with as empty. He was looking for a spiritual home, and perhaps the Nation could be that place. He did not, however let the outside world know it. Purdue University historian and Blood Brothers co-author Randy Roberts said much of America — "especially white America" — was terrified by the Nation of Islam. If a rising sportsman aligned himself with them, Roberts believes, that would have been fatal to his future. The boxing establishment — sportswriters, promoters, backers — wouldn't tolerate that. "If he's a member of this organization, you can write him off," Roberts says, "he will never get a shot at the championship." So Clay kept his faith to himself, until he beat Sonny Liston. While shock waves from that victory were still reverberating, he made the announcement that he was indeed a member of the Nation. The black establishment wasn't any more thrilled than the white one had been, says Johnny Smith. "Here you have the most famous mainstream civil rights leaders, heroes — King, [Jackie] Robinson, Floyd Patterson — who were criticizing Clay for joining the Nation of Islam." Robinson, who had retired from Major League Baseball by then, even went public with his dislike. "He quarreled with Malcolm in the press, criticized him," Smith says. "He believed that Malcolm's approach set back the civil rights movement." The Nation, with its stridently anti-white ideology, was the exact opposite of the peaceful integration mainstream civil rights leaders had been working for. Interestingly, by the time of the Clay-Liston fight, Malcolm's influence was waning as Ali's began to rise. Malcolm had been declared persona non grata by the Nation for what they saw as self-aggrandizement. He was also criticized for revealing that the Nation's revered founder, who was addressed as the Honorable Elijah Muhammad, had fathered several out-of-wedlock children with his secretaries. Furious at being questioned by an underling, Elijah Muhammad suspended Malcolm and forbade him to speak publicly. Malcolm left the Nation soon after the rupture. He thought Ali would go with him. Ali, by then inextricably associated with the Nation, turned his back on his old friend. The boxer was still a believer in Elijah Muhammad and the religion he'd founded, and was deeply offended by what he saw as Malcolm's disloyalty. Johnny Smith says the two saw each other only once more: Both men were in Africa, in Ghana, when they met in the plaza outside the Ambassador Hotel in the capital city, Accra. And what happens, recounts Smith, is this: "Ali and Malcolm, their eyes meet. And at that moment, Malcolm says, 'Brother Muhammad! Brother Muhammad!' He wants to engage with him, say hello. He doesn't know Ali is mad at him, that they're no longer friends. He's got this half-smile on his face. And Muhammad Ali, just stone-faced, says, 'Brother Malcolm, you shouldn't have crossed the Honorable Elijah Muhammad.' And he essentially walks away from him." Ali was accompanied by Elijah Muhammad's son, and he could hardly have been seen to embrace the man whom the Nation had declared its mortal enemy. A marked man, Malcolm was assassinated early the next year. Randy Roberts says, "One of Ali's greatest regrets — and he said as much — is that he never patched things up with Malcolm, that he never told Malcolm how important he was to him." Interestingly, Ali would also eventually leave the Nation of Islam to convert to Sunni Islam, the same orthodox Muslim faith his former mentor had embraced after leaving the Nation. Malcolm is dead. Ali's voice has been quieted by Parkinson's disease, but the legacy of their friendship is still very much with us, say the co-authors of Blood Brothers. Roberts points to the fusion of politics and sports. "Once, we viewed sports as a world apart, untouched by the political and economic and racial problems of the day," Roberts says. "Well, since Muhammad Ali, we can never maintain that fiction." And because of his association with Malcolm X, a brilliant young boxer became an ambassador to the world and an icon in and beyond black America. On this day in 1964, a young boxer stepped into the ring as a contender and stepped out of it a champion. Cassius Clay, who would later change his name to Muhammad Ali, defeated Sonny Liston for the heavyweight title. It also marked a turning point in Clay's relationship with another leading figure of that era - black nationalist Malcolm X. Their connection is explored in the new book "Blood Brothers: The Fatal Friendship Between Muhammad Ali And Malcolm X." Here's Karen Grigsby Bates Bates from NPR's Code Switch team. KAREN GRIGSBY BATES, BYLINE: Malcolm and Ali are solo names globally recognized now. But in the early '60s, Malcolm X was the better known for his separatist views and his stinging criticism of American racism. MALCOLM X: Black people in this country have been the victims of violence at the hands of the white man for 400 years. BATES: In "Blood Brothers," historian Randy Roberts says for many Americans, Malcolm X was more notorious than famous. RANDY ROBERTS: You've got to remember at this time, the Nation of Islam is viewed by most Americans - particularly white Americans - as a hate organization. BATES: While Ali, whose birth name was Cassius Clay, wasn't feared, he was dismissed as a cocky athlete. ALI: I'm way ahead of schedule. My time and my act would say the name is poor, the man is is flat-footed, the man don't stand a chance, the stage has been set. BATES: Malcolm and Clay first met in May 1962 at a Nation of Islam rally in Detroit where Malcolm was the opening speaker. They each came away impressed. Historian and co-author Johnny Smith says young Cassius had never heard a black man speak like Malcolm. JOHNNY SMITH: There was this confidence, this authority that Malcolm offered, you know, when he spoke at the podium that day. And it made a profound impression on young Cassius Clay. BATES: Malcolm was struck by the young boxer's magnetism. He believed people could be drawn to the Nation by Clay's swagger. ALI: I'm a poet. I'm the prophet. I'm the resurrector (ph). I'm the savior of the boxing world. If it wasn't for me, the game would be dead. BATES: They developed a warm friendship. Malcolm was part big brother, part father figure to young Cassius. And Cassius, searching for a spiritual home, found it in Malcolm and the Nation of Islam. Randy Roberts says initially, the boxer didn't advertise his relationship with Malcolm because the Nation of Islam terrified much of America, including the civil rights establishment and the boxing industry. ROBERTS: If he's a member of this organization, his career is over. You can write him off. He will never get a shot at the championship. BATES: So Clay continued to learn about the nation and adopted some of its practices, like giving up pork, quietly. In the weigh-in before his match with world heavyweight champ Sonny Liston, Clay only talked about the fight, not his faith. ALI: I'm young; I'm handsome; I'm fast; I'm pretty and can't possibly be beat. If you like to lose your money, be a fool and bet on Sonny. BATES: Clay predicted he'd beat Liston in eight rounds - wrong. He beat him in seven. UNIDENTIFIED ANNOUNCER: And what's happened - Clay has won. Clay has won. BATES: The day after his victory over Liston, Clay announced he was indeed a member of the Nation of Islam. A month later, he would become Muhammad Ali and remain an activist athlete. He and Malcolm openly continued their friendship. But Malcolm's stock in the Nation and with its founder Elijah Muhammad was slipping just as Ali's fame was beginning to soar. Johnny Smith. SMITH: There are people that are close to Elijah Muhammad who think, you know, we don't really need Malcolm X, especially now that we have the heavyweight champion, who can be a better spokesman for us. BATES: Malcolm left the Nation of Islam after he discovered Elijah Muhammad had several children by his young secretaries, and he went public with the discovery. That shattered his friendship with Ali. The two never repaired the rift. They met physically only once more when they ended up on the same plaza in Accra, Ghana. Johnny Smith. SMITH: Their eyes meet. And at that moment, Malcolm says brother Muhammad - he's got this half smile on his face - and Muhammad Ali just stone-faced says brother Malcolm, you shouldn't have crossed the honorable Elijah Muhammad. And he essentially walks away from him. BATES: Malcolm, by then a marked man, was assassinated early the next year. Randy Roberts says that moment in Accra haunted Ali. ROBERTS: One of his greatest regrets is that he never patched it up with Malcolm, that he didn't tell Malcolm how important Malcolm was to him, that he wasn't able to explain that really without Malcolm, he would never have become Muhammad Ali. BATES: The friendship between the two was ended, but the fusion of politics and sports that Ali and Malcolm began continues to this day. Karen Grigsby Bates, NPR News. Transcript provided by NPR, Copyright NPR.